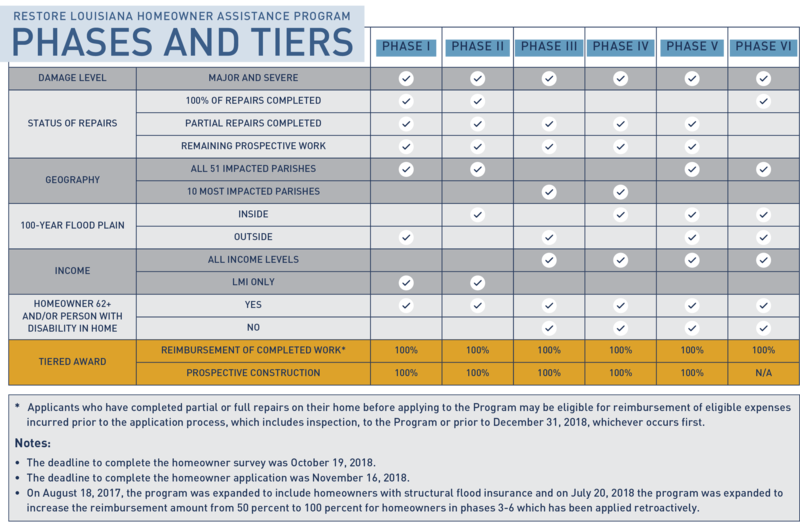 The program is designed to help all flood-impacted homeowners who meet the eligibility requirements detailed on this page. Program policy requires homeowners to self-certify that they still own the damaged property and have not transferred it or received notices of default or seizure related to taxes, mortgage, or title prior to receiving a grant award. Additionally, the Program requires that homeowners maintain ownership throughout the entirety of their participation in the Program. On August 18, 2017, the program was expanded to include homeowners with structural flood insurance and on July 20, 2018 the program was expanded to increase the reimbursement amount from 50 percent to 100 percent for homeowners in phases 3-6 which has been applied retroactively. NOTE: These phases also determine the order in which you apply. It is possible that if the survey indicates you qualify, you may be required to wait before the actual application begins. * Low-to-moderate income is defined as a household with a total annual income that is 80 percent or less than the area median income of the parish or metropolitan area. You can find the full Area Median Income table here.